What’s better than eating a Slim Jim??? How about a Slim Jim Sword Fight! That’s right, you get to channel your inner Macho Man for this epic battle! Once you have selected your warriors, have them put on their goggles (you can get these at the Dollar Store)- they are going to war after all! You will then need to hand them an opened Slim Jim so that they are ready for their battle. 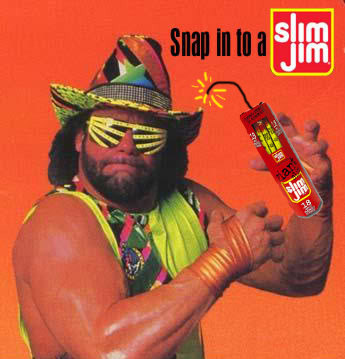 This Slim Jim Battle will be done like fencing. Remind them that their goal is NOT to leave a mark on the other person! Whoever makes contact first, wins. Set a 60-second time limit and boundaries so that you have a winner for each pairing. After the first round is played, keeping pairing groups down until you have a championship round and winner. 1. If you really want to go crazy, let your entire group play the game, just know that chaos is likely to ensue! 2. Make the boundaries smaller if a pairing has not scored a point after 60-seconds. The goal is to get them close enough that eventually one person will have to win. 3. I recommend playing first person to 2 or 3, but feel free to make a one and done scenario if you’re crunched for time. 4. Award a box of Slim Jims (you can buy them at Sam’s Club or Costco) to the winner.